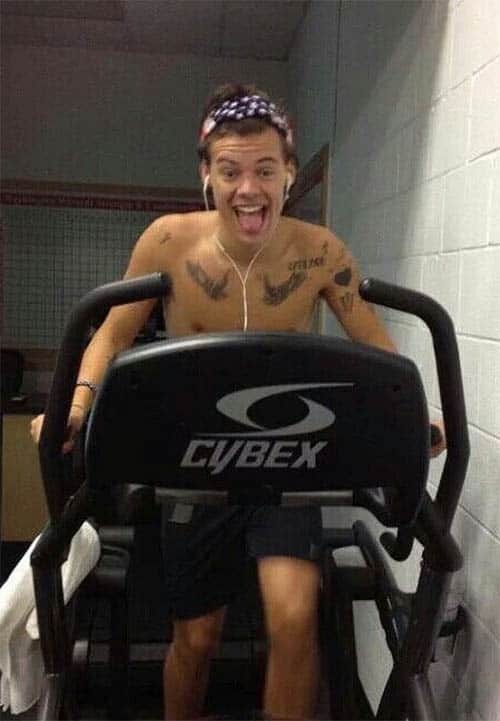 Harry Styles is a well known celebrity that is perhaps best known for his time in one direction. 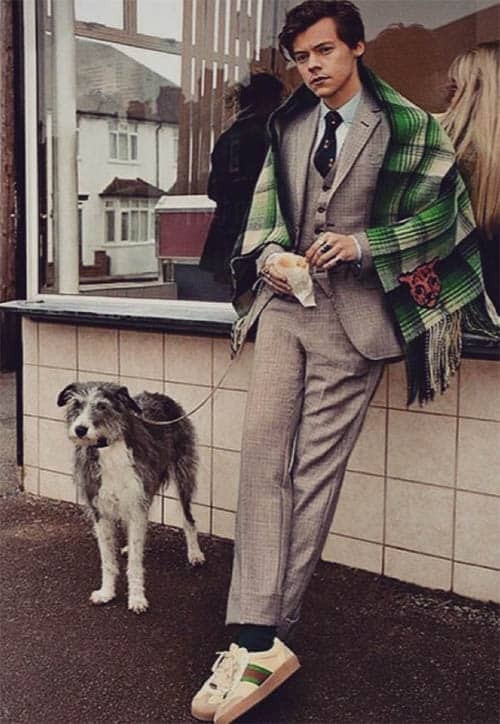 As well as being a top music star he is also a person that can be considered a style icon. 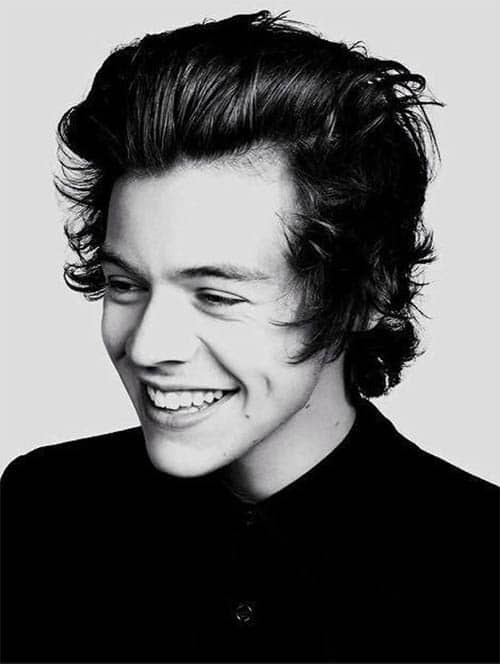 One of the things that Harry Styles is best known for are his selection of haircuts and looks. 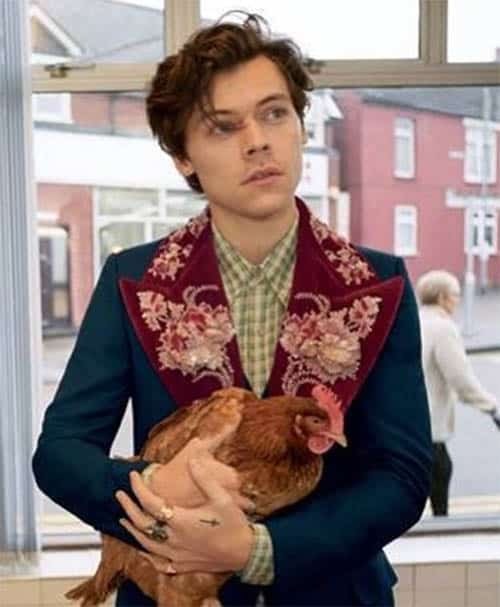 If you are interested in getting the Harry Styles look, it’s not as easy to decide on which type of look may suit you best. 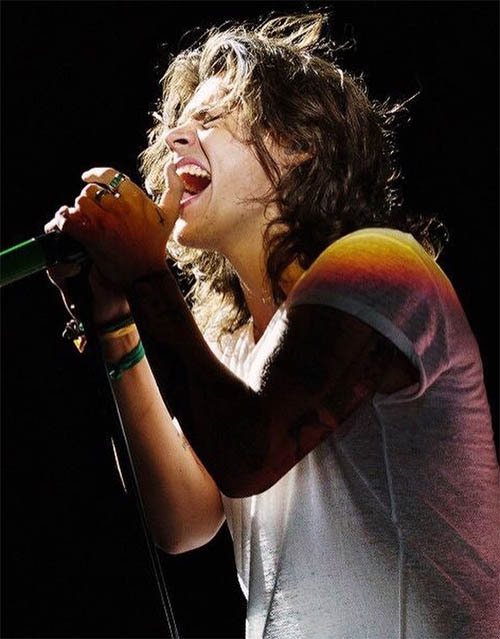 Harry Styles generally changes his hair at least once every 4-6 months. 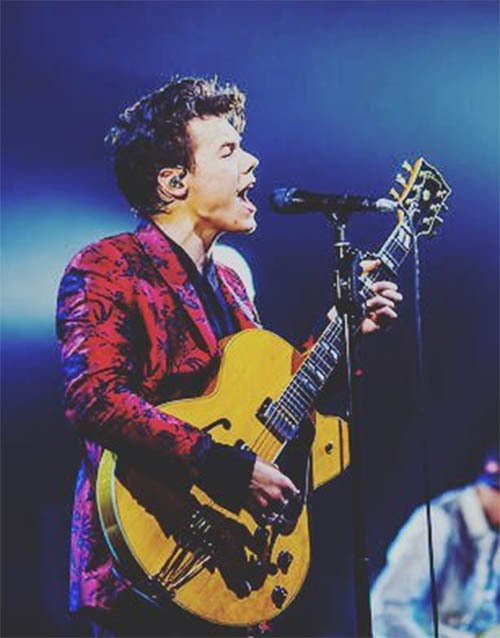 With a style that can easily handle medium length hair, longer hair or short hair it can be tough to stay up on the latest Harry Styles Haircuts. 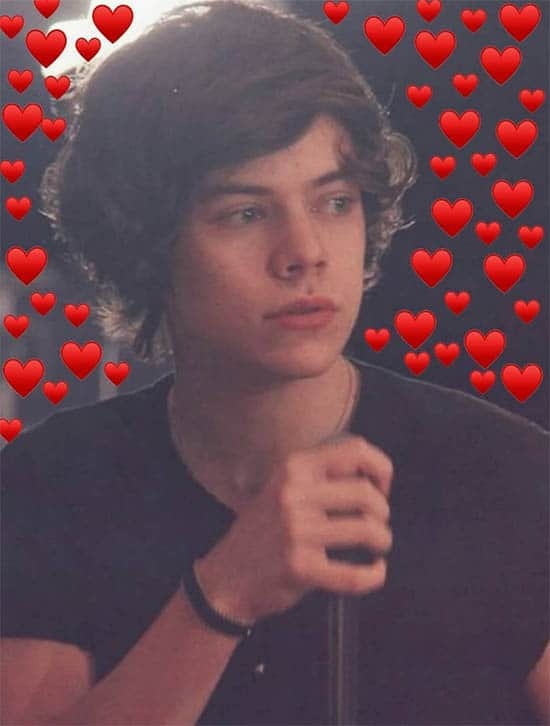 In this article, it’s our goal to go through some of the top looks that Harry Styles has enjoyed throughout the years. 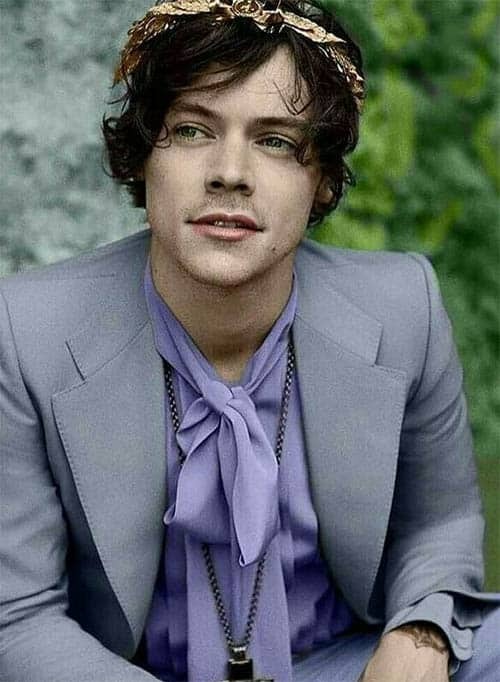 Taking some inspiration from these looks and trying some of these top Harry Styles Haircuts could be the secret to success with looking your best. 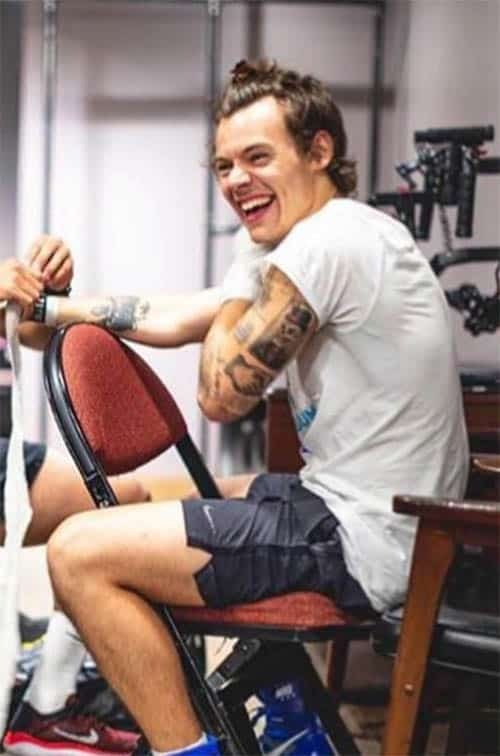 With some of these pictures, we can explore some of the best books that Harry Styles has enjoyed with his hair and give you plenty of reference to get the same look from your barber. 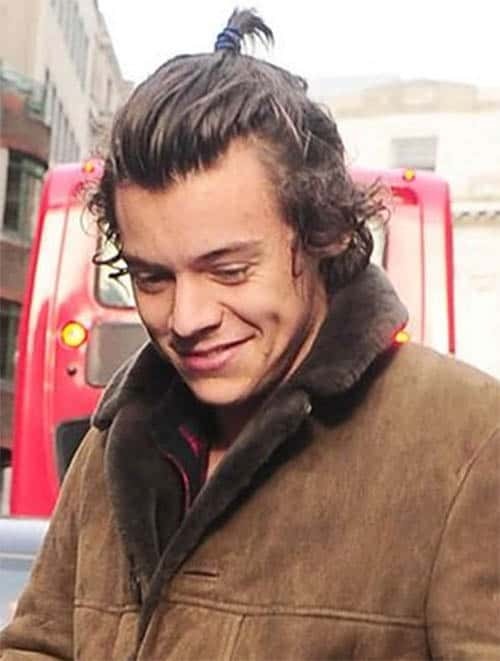 The short style curls have long been considered one of the best recent looks for Harry Styles. This look is often accentuated with items like headbands or other types of accessories. The short curls can be low maintenance and often sit around the shoulder length. The swept bangs look is something that sits around shoulder length. The curls can be styled towards the back of the head with the bangs swept along to the sides. It’s important to leave some natural length as well as use styling gel to keep bangs out of your eyes. The Long flow is a style that is categorized by hair that goes a bit longer beyond the shoulder. This could take a few years to grow out and it often involves regularly trimming the ends to account for split ends. This is a look that is ready for quick styling as soon as you get out of bed. With a light trim you can be ready to showcase a more professional side. This is a look that is quite easy to maintain with longer bangs and a shorter trimmed back. If you are looking for a longer hair look but you don’t want to deal with the extra hair, this is a nice compromise. The simple top knot has become a fashion staple for several years now. This is a low maintenance look that involves a quick hair tie and a tight bun along the top of the head. It takes just a short amount of time to style and create a carefree look. 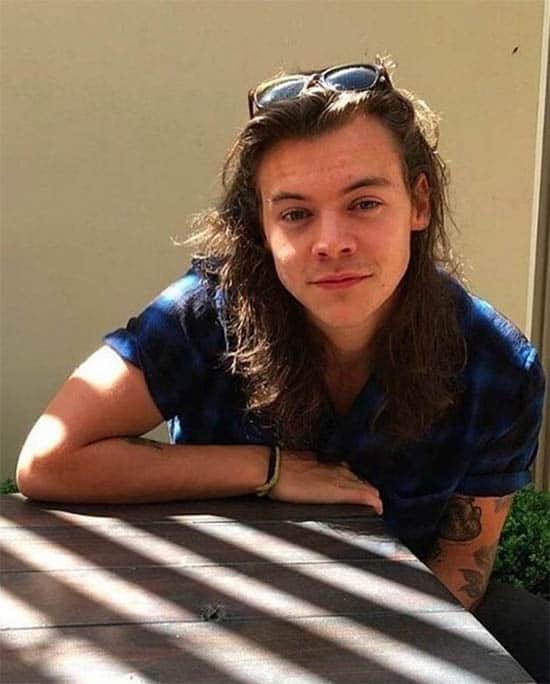 The swept over look is a classic Harry Styles Haircut. 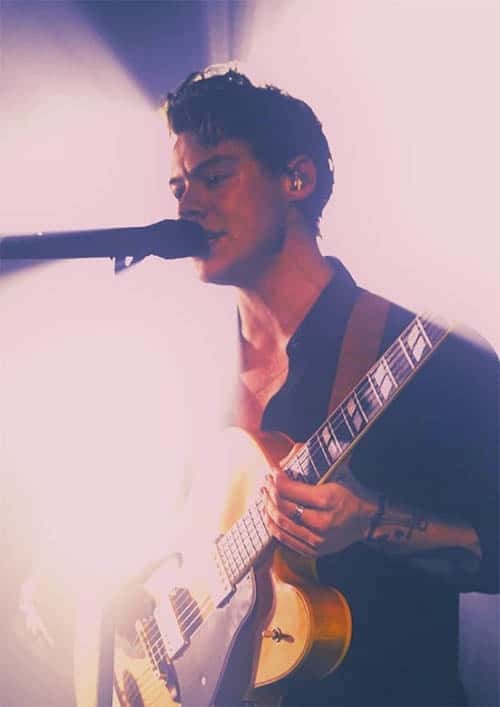 This is one of the original haircuts that he had in touring with the band. The swept over look features longer bangs, a lengthier back and plenty of depth. You can continue to style this look with regular appointments to trim up bangs. This look involves the use of a medium length cut. 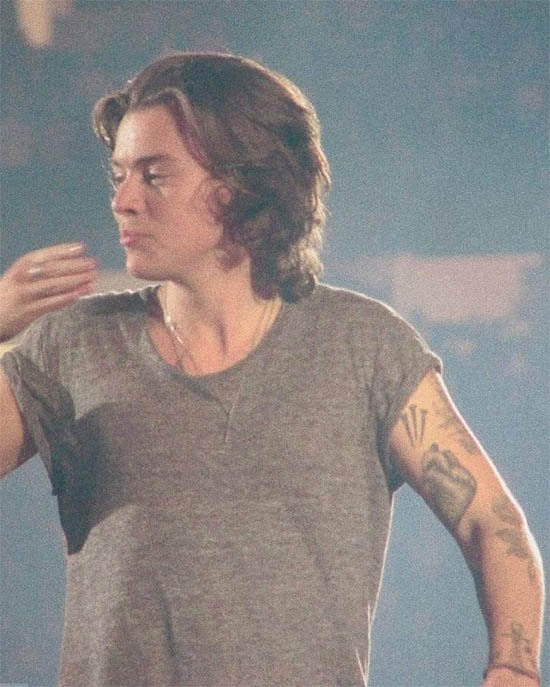 This has become a more modern Harry Styles Haircut. With the bangs gelled or waxed upward and the sides waxed down, you can create a modern rock look. This look can be similar to the styled bangs but with a bit more edge. 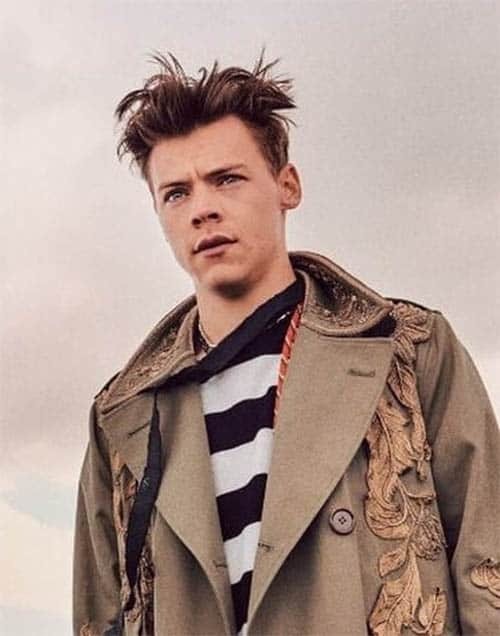 With a medium length cut, you can spike up the bangs and sides closer to this stage look from Harry Styles. This could be perfect for a night out on the town. 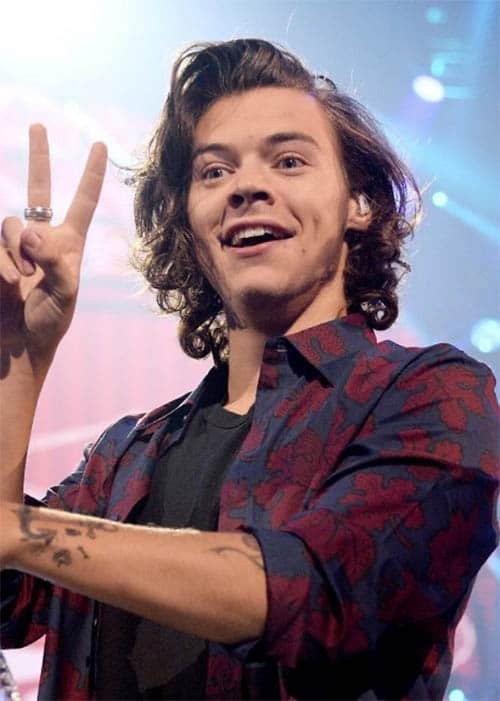 The styled bangs curl is a Harry Styles haircut that utilizes some of his long hair in a fairly controlled way. 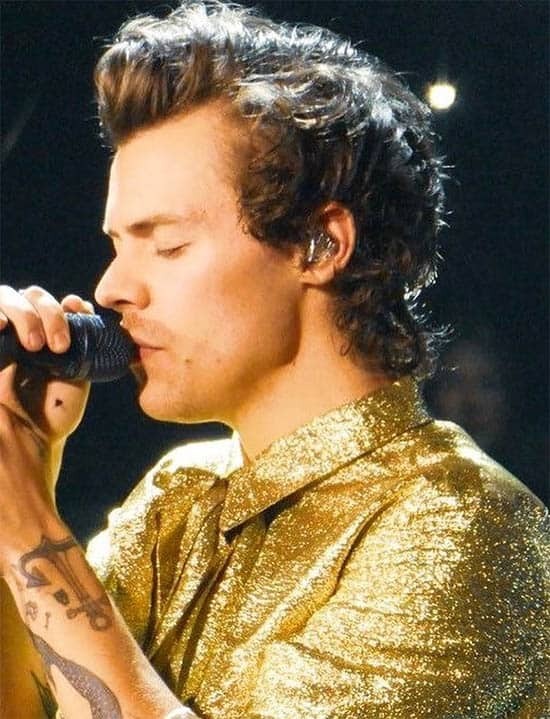 This look is a little bit Elvis and remains a very classic Harry Styles haircut that you could model yourself. 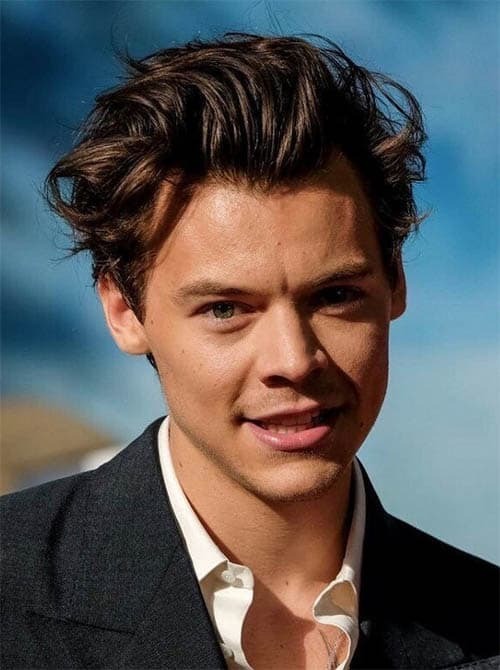 Rather than using a traditional topknot that involves a very large bun, this can be a Harry Styles Haircut that is casual and lighter on top. Rather than having to collect all of your hair, this can be a look you can model even with just a medium cut. 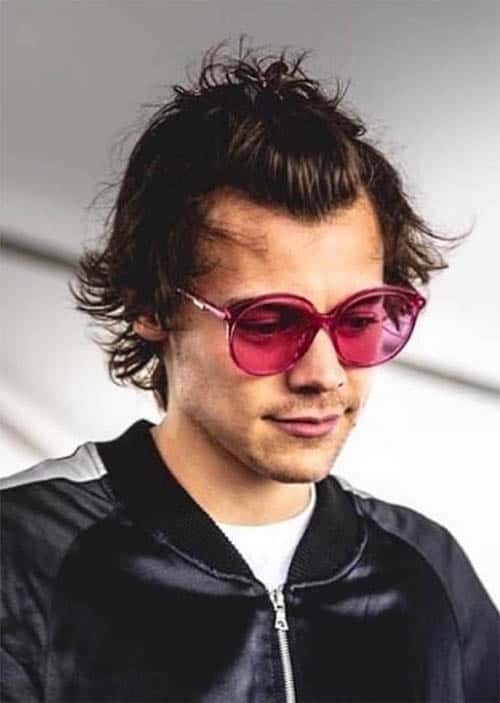 Medium styled is a classic buddy holly style look that Harry Styles has been using for some time. This styled look involves shorter sides and swept out bangs. This is a very casual cut that you can emulate in your own style. Modelled after a more traditional pompadour, this is a shorter look with some volume and a slightly pronounced cut along the side. 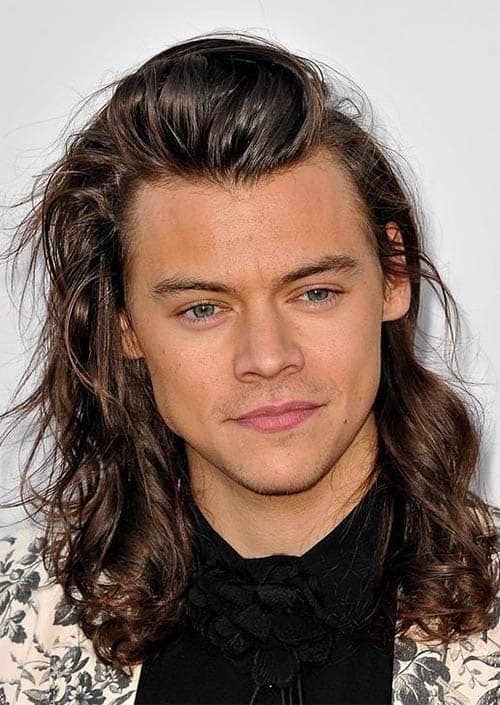 This Harry Styles cut would be mostly done using shears and can produce a very defined and rock style pomp. The wet styled curls is a look that is a little bit more untamed. With the right styling gel you can produce curls and a wet look that doesn’t fade throughout the day. 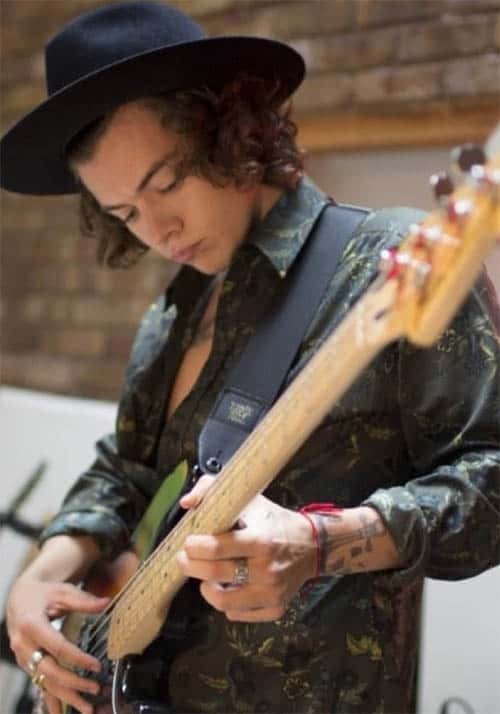 Harry Styles Haircuts can involve regular styling gel or product to get that rock star stage look. This is a longer look that is something you might see in a modeling shoot. If you have just past shoulder length hair, this can be a very quick style that you can use to keep things more manageable and to be ready for the red carpet. With longer hair, it can sometimes be easier to enjoy a look that requires absolutely 0 styling. 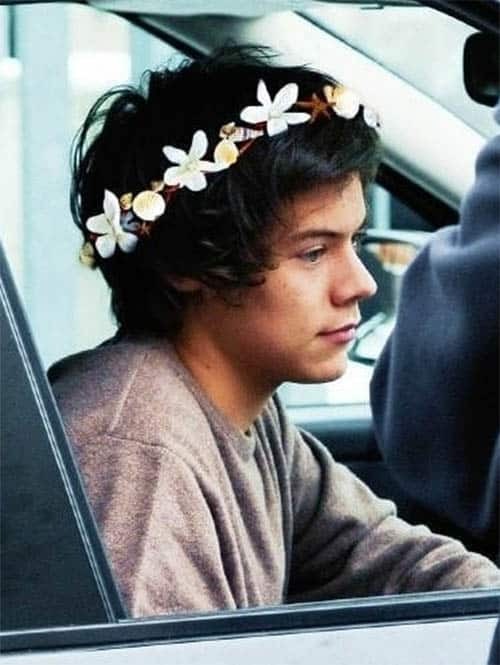 This is a look that caused a bit of drama with the One Direction Crowd. 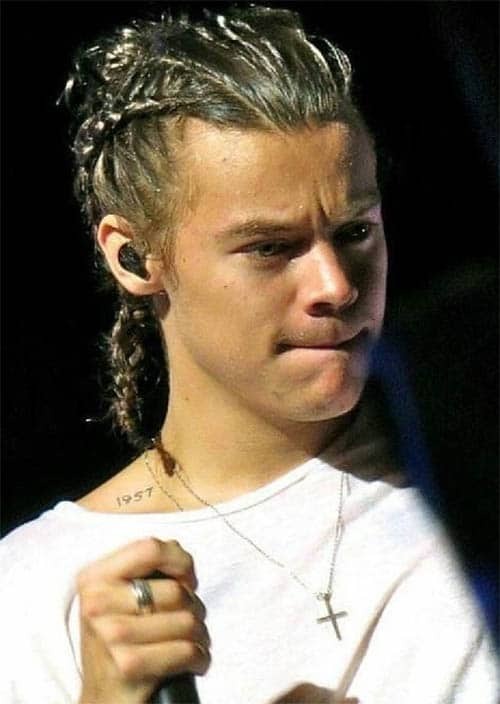 Rather than letting his hair go free, Harry Styles decided to go with braids for a few concerts. 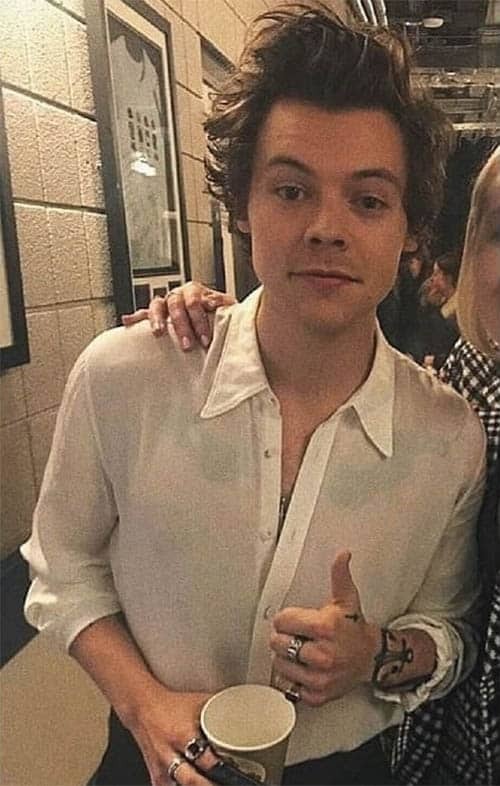 The slicked back look is just a little bit different from the spiked bangs that have been made famous by Harry Styles. This is a look that involves a bit more a sweep from the bangs and besides tapered down with a bit of gel or product. The styled up bangs look is slightly different from the spiked choice in Harry Styles Haircuts. This is a look that has much shorter sides and bangs that have been lightly tamed back with some product. The styled up bangs look is a popular choice for a modern cut. The curls with accessories look is a wonderful way to keep bangs in check while looking plenty rock and roll. 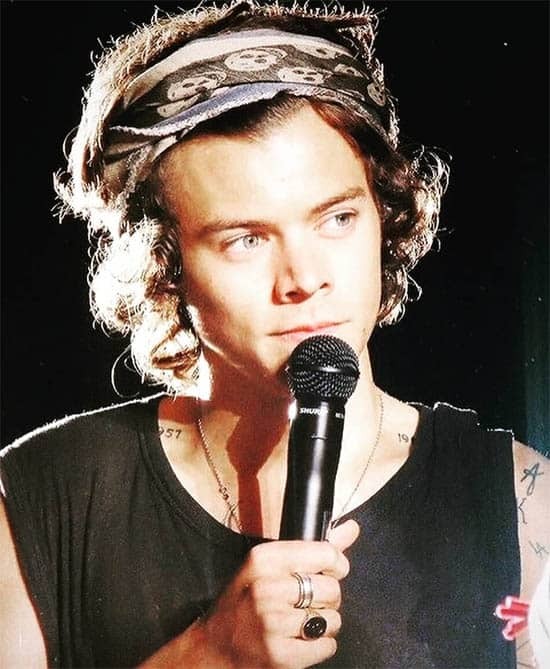 This Harry Styles look usually involves headbands and curled bangs at about a shoulder length. 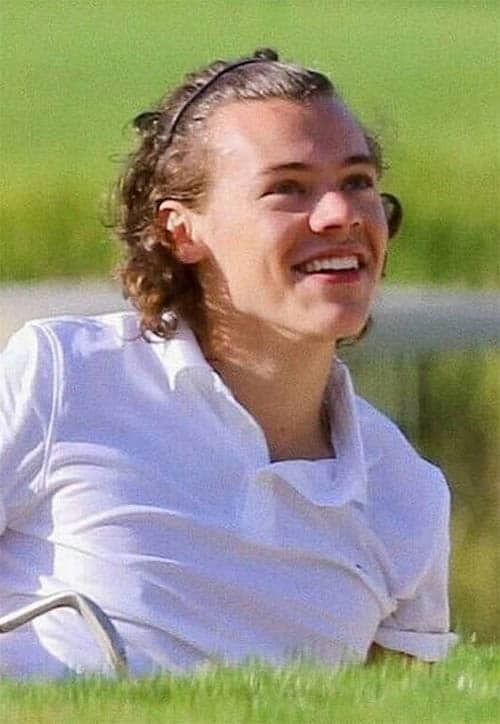 A simple pony represents one of the simplest Harry Styles Haircuts. If you have trimmed longer hair, you can simply tie it back in a ponytail for quite an elegant look. 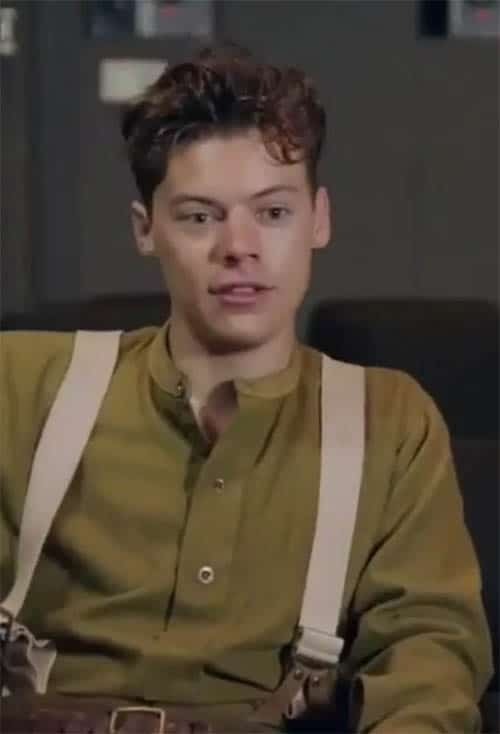 Harry Styles shaved the sides of his head in order to get his role in Dunkirk. As his hair continued to grow out he styled it in different ways with one of the best being the embrace of his bangs with a shorter style on the sides. The vintage swoop is a little bit Elvis and older style. 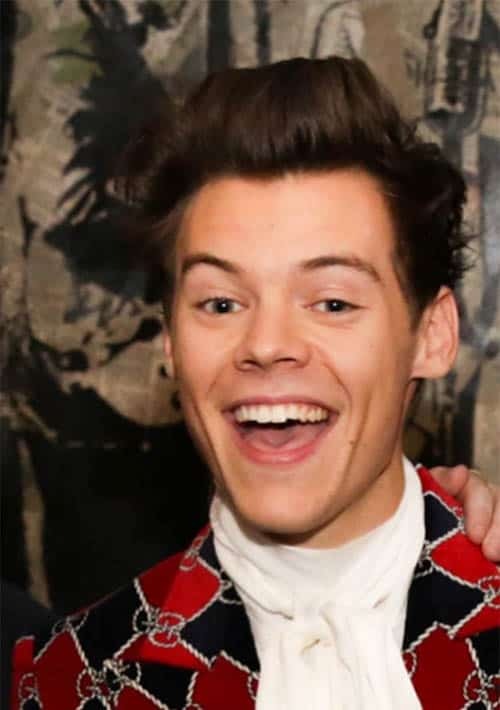 It is a look that has been completely revitalized by Harry Styles Haircuts. The vintage swoop is a look that you could also recreate. 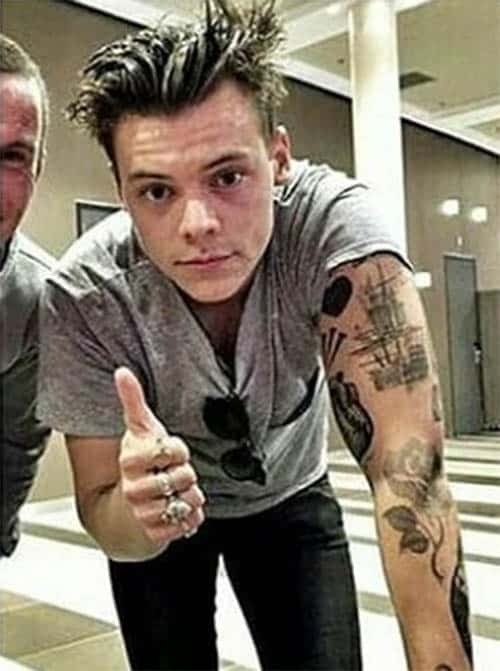 The short bang swoop was a look that was introduced as a Harry Styles haircut quite recently. It showcases a more modern style where the part changes directions and keeps things more trim and manageable. The bang sweepback is a simple solution for a quick sweep of the bangs to keep them under control. A controlled sweepback with styling gel can create a nice look and with a quick style option. The styled outside part is a heavily styled look that can involve some extra product like wax or gel. 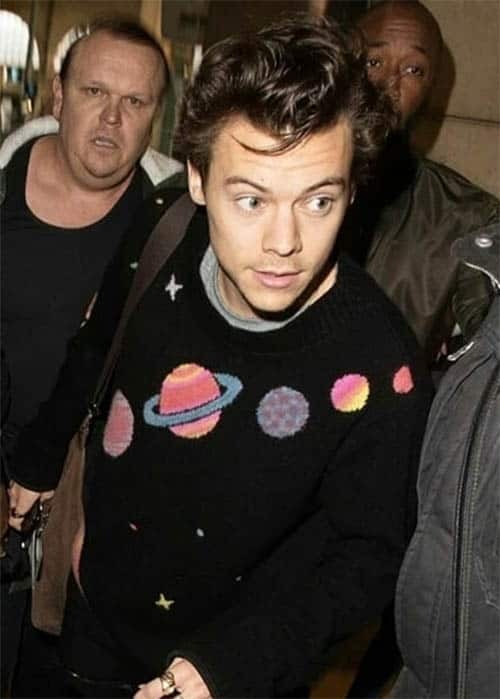 The style itself stays glued in place quite easily and is a professional look you can get for your Harry Styles Haircut. 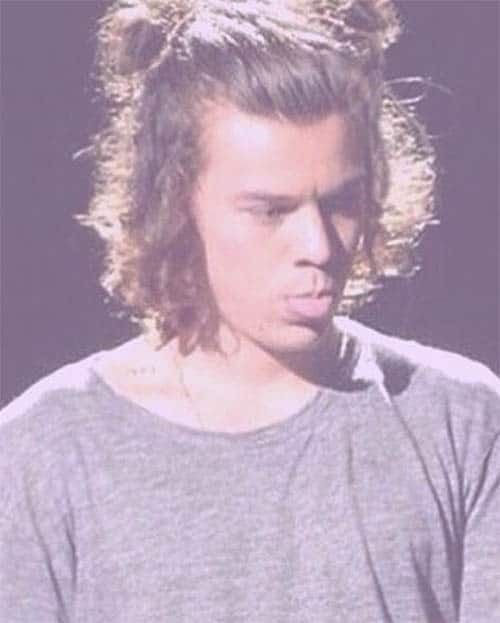 The simplest of casual styles often involves a Harry Styles Haircut with his hair slicked back and the look of a headband. This is a simple way that you can style longer hair and get the most out of your style even with longer hair. 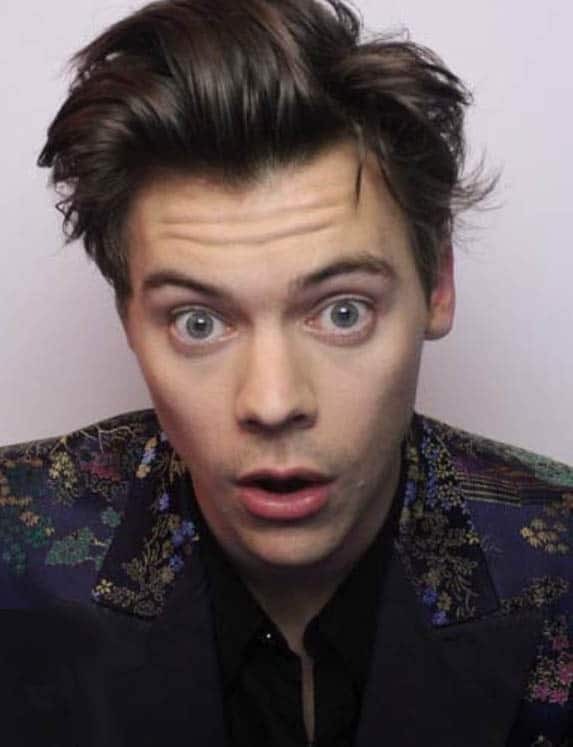 If you are keeping your bangs long for a Harry Styles Haircut, you could consider using the bangs to frame up your face and get people to focus on key features. The styles framing bangs look can be a perfect example. A heavy slickback look involves really pinning your bangs back and the rest of your hair as well. 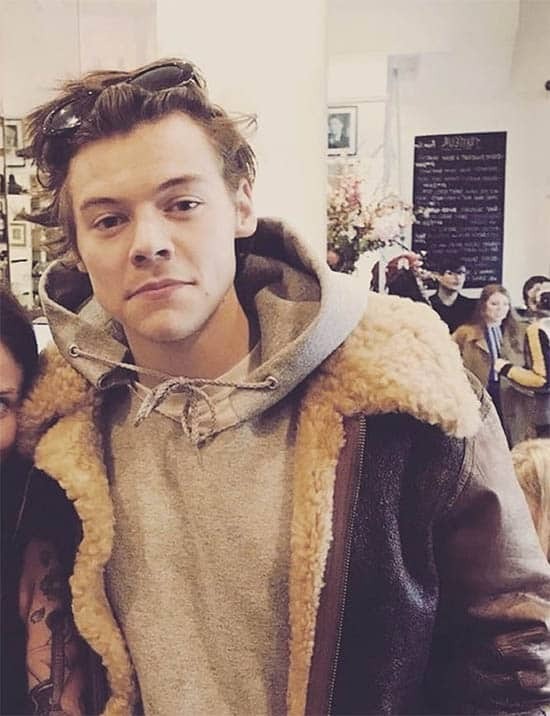 This is a look that is fairly popular amongst Harry Styles Haircuts. The single bang curl is a medium length cut that really pays homage to some of the popular cuts of the 1960s and 1950s. Embracing the length of the bangs and turning them into a satisfying curl can create functional style that looks best in a variety of situations. The long styled look is a bit more rock and roll. 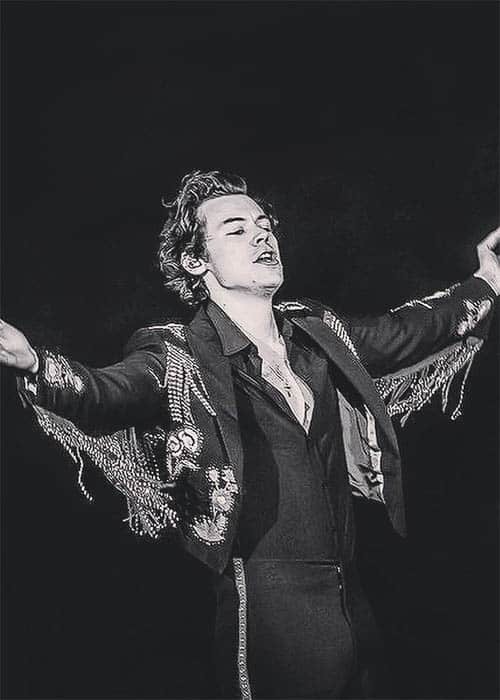 This was a look popularized by Mick Jagger and others and it remains very fashionable today. The top bun is an elegant styling choice for those that have longer hair. A large and messy top bun can help to manage some of the hair and remain one of the best looks for a styling choice. Free flow shoulder length hair often involves the use of a bit of styling from a straighter in order to get the right look. A free flow shoulder length hair can be a wonderful way that you can manage longer hair and enjoy it without having to manage it. 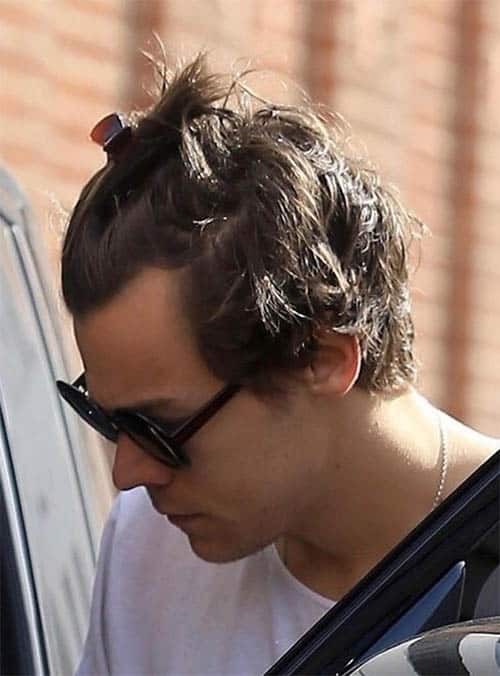 The pinned up looked is a Harry Styles Haircut that involves the use of several bobby pins and some light styling gel. The Pinned up look can be easy to emulate and it’s something that will stay in place over the whole day. The side part Bang curl is a combination of a simple side part and the bang curl style. It is a look that is the perfect way to showcase thicker bangs while keeping the rest of your hair in check. 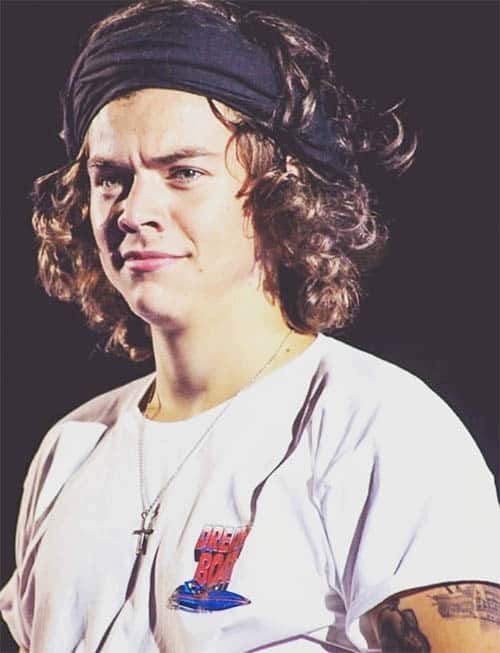 The medium length tight curls are a Harry Styles Haircut that might even involve a light perm for some people. Tighter curls can be tougher to replicate without a curling iron or high heat, but they can produce quite a striking look. 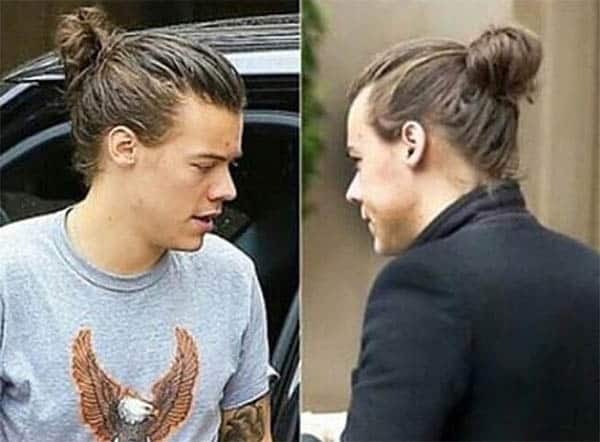 The double bun started out as a bit of a joke for several different concerts and it became a fun style choice for the future. Medium length shoulder curls are a very manageable look that you can keep in check for almost any style profile. These curls come naturally and can be one of the best ways to enhance medium length hair with light curling iron styling. 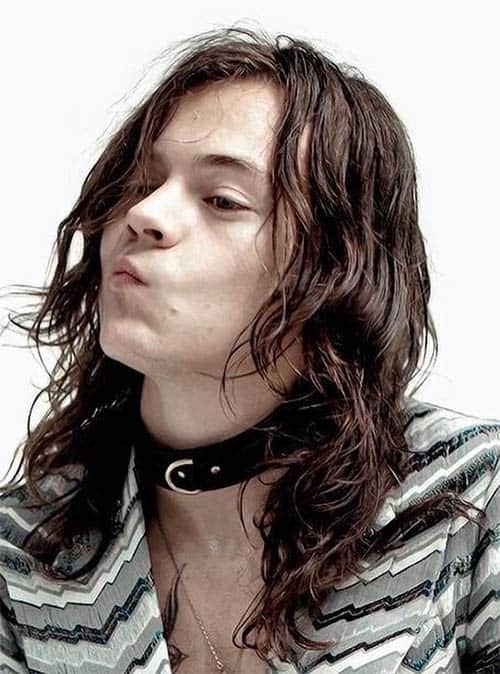 The medium length school cut was made popular as Harry Styles was a bit younger. This is a simple school cut that could be great for any time of the year or for an elementary school look. A Large bun style can be a fun way to control longer hair and keep a nice look for your shoulder length or greater haircut while managing it. A large messy bun is a wonderful way that you can style your hair up quickly and with nothing more than a hair tie. Rather than using an accessory like a hair tie or even bobby pins, you might want to consider the idea of a clipped up look. This style can be a fun way that you can quickly style your hair and keep it in check to pull down whenever you want. If you are interested in more of a striking look for your next haircut, you may want to consider the idea of doing a bit of highlights with your cut. 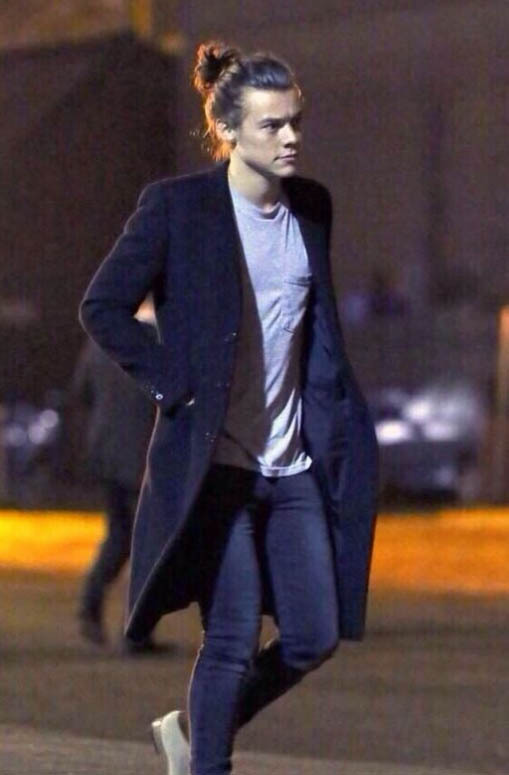 Choosing a blonde style could help you emulate this Harry Styles Haircut. 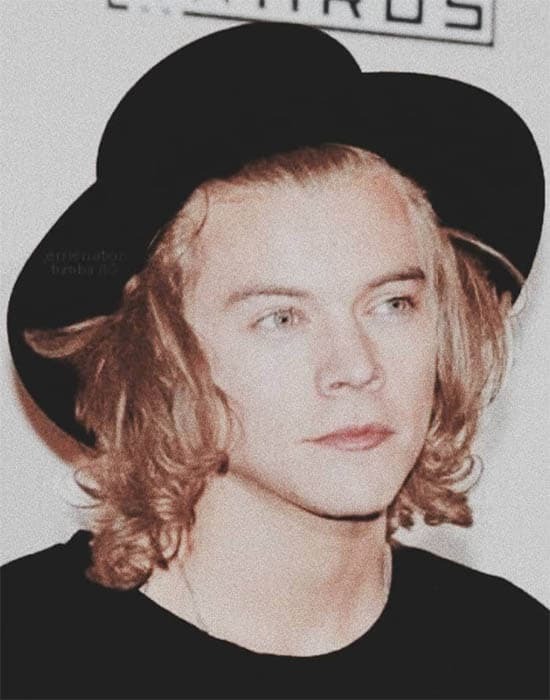 When changing his hair to blonde, it sent waves through the style community! 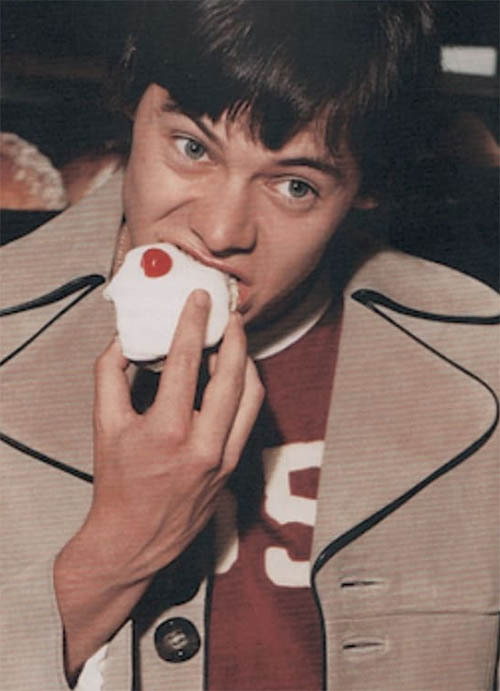 The trimmed up bangs look is a Harry Styles look that was made quite popular during his school days. This simple schoolboy cut is easy to emulate and it creates a look that has real vintage style. 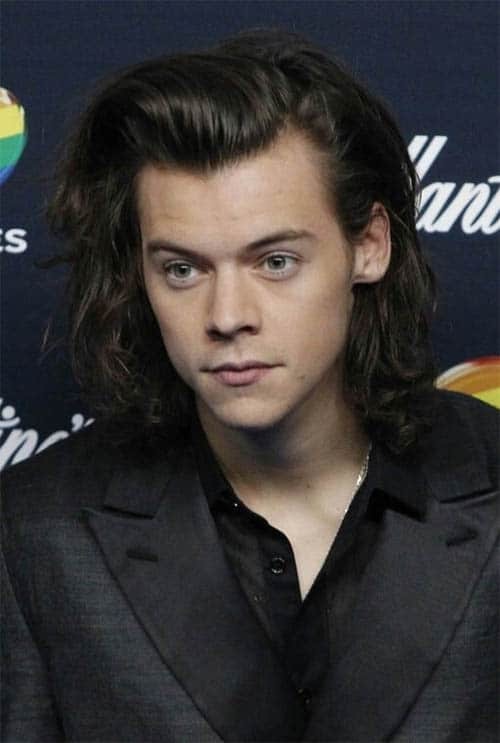 The trimmed over look is a Harry Styles haircut that is a bit more modern and stylish. This is more of a simple side part that can also produce a striking result for fashion shoots or everyday wear. 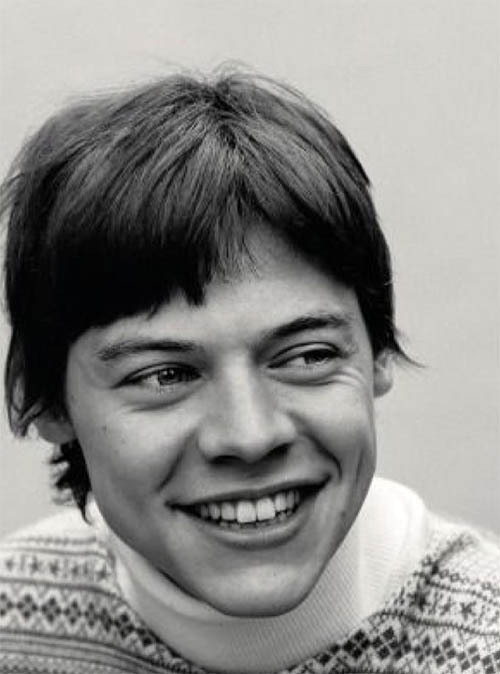 A medium length trimmed bangs look is one that you may recognize from younger Harry Styles. The look itself has become widely shared and copied throughout the years but it remains a popular choice! Get The Harry Styles Cut For You! 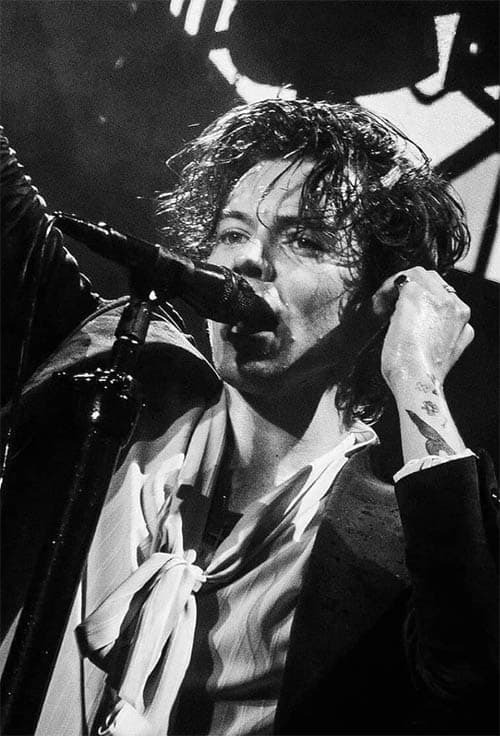 If you are interested in matching the amazing style of Harry Styles, you may want to consider starting with one of the staples of his look which is his incredible hair. With so many styles to match, hopefully this list will help you with some of the top choices you can make for hair styles!